We are a specialist company providing central heating and boiler installations throughout the Leeds area, and thanks to our wide-ranging experience, we have an in-depth knowledge of the heating industry. We know that investing in a new boiler or central heating can be daunting and expensive, so we ensure that our advice is clear, easy to understand and unbiased. We’ll spend time working with you to identify a boiler or heating system that’s perfectly suited to your home and budget. 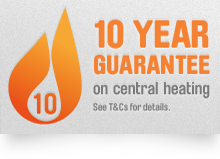 We also offer a range of tailor-made central heating and boiler packages, designed to help our customers save up to 40% on their annual gas bill. Nothing beats the peace of mind that comes with finding a plumbing company you can rely on and if you are looking for a qualified, professional heating engineer in Leeds , why not get in touch with Tuke Heating? Our services cover everything from dripping taps through to heating installations and we’re happy to give you a free, no-obligation quote or impartial advice for work both north and south of Leeds.